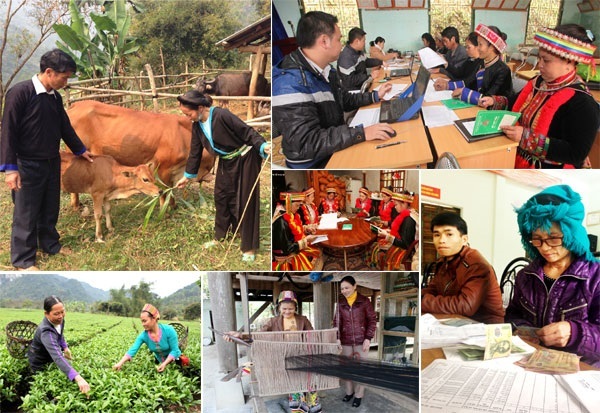 This Decree provides activities in ethnic minorities work in order to assure and promote equality, solidarity, mutual assistance for development, respect for and preservation of cultural identities of ethnic minority groups living in the territory of the Socialist Republic of Vietnam. This Decree applies 10 state agencies carrying out ethnic minorities work; and domestic and foreign organizations and individuals implementing the ethnic minority policy in the territory of the Socialist Republic of Vietnam. 1. To implement the ethnic minority policy on the principles of equality, solidarity, respect and mutual assistance for development. 2. To assure and implement the policy on comprehensive development and gradual improvement of material and spiritual life for ethnic minority people. 3. To assure preservation of the language, scripts and identity, and promotion of fine customs, habits, traditions and culture, of each ethnic minority group. 4. An ethnic minority group shall respect customs and habits of other groups, contributing to building an advanced Vietnamese culture deeply imbued with the national identity. 1. Ethnic, minorities work means state management activities in ethnic minority affairs in order to impact and create conditions for development of ethnic minority groups while guaranteeing respect for and protection of lawful rights and interests of citizens. 2. Ethnic minority group means an ethnic group with a population smaller than that of the ethnic majority group within the territory of the Socialist Republic of Vietnam. 3. Ethnic majority group means an ethnic group with a population accounting for over 50% of the country's total population according to national population survey. 4. Ethnic minority area means an area in which different ethnic minority groups live together, forming a stable community in the territory of the Socialist Republic of Vietnam. 5. Ethnic minority group with a very small population means an ethnic group with a population of under 10,000.
c) Essential technical infrastructure is of poor quality and only meets minimum needs of inhabitants. Each ethnic minority group has its own name and is identified according to lawfully recognized criteria and such identification meets the expectation of that group. Ethnic minorities shall be identified and announced by a competent agency under law. 1. 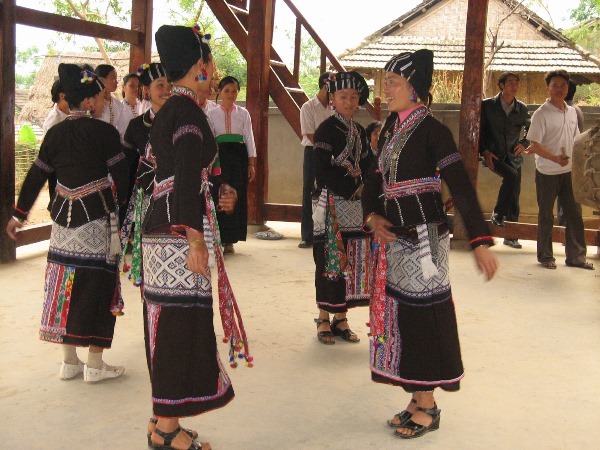 The national congress of Vietnam's ethnic minority groups shall be held every 10 years. 2. Provincial- and district-level congresses of ethnic minority groups shall be held every 5 years. 1. Stigmatizing, discriminating, dividing and undermining the unity of ethnic minority groups. 2. Taking advantage of ethnic minorities issues to distort and oppose the Party's line and policies and the State's law. 3. Taking advantage of the implementation of the ethnic minority policy and slate management of ethnic minorities work to infringe upon state interests and lawful rights and interests of citizens. 4. Committing other acts in contravention of the Government's regulations. 1. Funds for the implementation of the ethnic minority policy shall be allocated from the state budget under current regulations on state budget decentralization and other lawful funding sources for comprehensive socio-economic development in ethnic minority areas, hunger elimination, poverty reduction and narrowing of the gap between ethnic minority areas and other areas. 2. To plan, train, retrain, use and manage human resources being local ethnic minority people and adopt appropriate treatment regimes for them. 3. To efficiently exploit and use natural resources in ethnic minority areas and make re­investment suitable to local socio-economic conditions. 4. To apply technical advances and introduce advanced science and technology into production in order to improve the living conditions of inhabitants in ethnic minority areas. 5. The Ministry of Planning and Investment and the Ministry of Finance shall, based on their assigned functions and tasks, assume the prime responsibility for, and coordinate with the Committee for Ethnic Minorities Affairs and concerned ministries, branches and localities in detailing and guiding this Article. 1. To assure investment in socio-economic development and essential infrastructure in ethnic minority areas; to effectively exploit the potential and strength of each area, to protect the eco-environment and promote the self-reliance and strength of ethnic minority groups. 2. To create favorable conditions for domestic and foreign organizations, individuals and enterprises to invest in development of ethnic minority areas; to give special priority to ethnic minority groups with a very small population and areas with socio-economic difficulties and exceptional socio-economic difficulties; to attach importance to providing vocational training for and employing locals. ensuring stable income for them, to build infrastructure and other public welfare works. 3. To restore and develop traditional handicrafts of ethnic minority groups to meet market economy requirements. 4. Investors of planning and construction projects that affect the land, environment, ecology and life of ethnic minority groups shall publicize these projects and collect under law opinions of inhabitants in areas to be the project sites; and organize resettlement and create conditions for relocated people to enjoy a better life in new areas. Administrations of localities of resettlement shall coordinate with investors in assuring and creating conditions for relocated people to stabilize their farming and life. 5. To reasonably plan and arrange concentrated residential points in areas with difficulties, assuring production development suitable to the characteristics of ethnic minority-groups and areas. 6. To implement programs and schemes on hunger elimination and poverty reduction and employment, to basically solve issues related to capital, residential land, farm land and production tools for land-lacking farmers. housing, daily-life water, economic development support, land and forest allocation to households in ethnic minority areas, and labor and trade restructuring towards industrialization, modernization and sustainable development. 7. To prevent and control natural disasters and rescue victims in affected areas. 8. To promptly adopt policies lo support ethnic minority groups with exceptional difficulties for .settlement and development. 9. The Ministries of Planning and Investment; Finance; Labor, War Invalids and Social Affairs; and Agriculture and Rural Development and the Committee for Ethnic Minorities Affairs shall, based on their assigned functions and tasks, assume the prime responsibility for and coordinate with concerned ministries, branches and localities in, detailing and guiding this Article. 1. To develop education in ethnic minority areas under the national program; to elaborate education policies for all educational levels suitable to the characteristics of ethnic minority groups. 2. To develop pre-schools, general schools, boarding and semi-boarding ethnic minority schools, continuing education centers. community learning centers, vocational schools and pre-university schools; to study tertiary multi-disciplinary training for ethnic minority students in order to accelerate human resource training in the service of national industrialization and modernization and international integration. 3. To specify appropriate conditions and measures to support ethnic minority students: to provide accommodation, scholarships and loans for ethnic minority students during their study suitable to their majors and places of residence. Students of ethnic minority groups with a very small population and in areas with socio-economic difficulties and exceptional socio­economic difficulties are exempt from school fees at all educational levels and in all disciplines. 4. To train human resources and provide vocational training for ethnic minority groups suitable to the characteristics of each area, meeting industrialization, modernization and international integration requirements. 5. To prescribe support for teachers in areas with socio-economic difficulties and exceptional socio-economic difficulties; to train ethnic minority teachers and teachers of ethnic minority languages. 6. To include languages, scripts and fine cultural traditions of ethnic minority groups into curricula of general schools, boarding and semi-boarding ethnic minority schools, continuing education centers, community learning centers. vocational schools, professional secondary schools, colleges and universities suitable to ethnic minority areas. 7. Administrations of localities which have ethnic minority students passing university and college entrance exams or admitted under designated enrollment shall receive these students after they graduate and assign jobs appropriate to their majors. 8. The Ministry of Education and Training, the Ministry of Labor, War Invalids and Social Affairs and the Committee for Ethnic Minorities Affairs shall, based on their assigned functions and tasks, assume the prime responsibility for, and coordinate with concerned ministries, branches and localities in. detailing and guiding this Article. 1. Qualified ethnic minority cadres who meet criteria prescribed by law may be appointed to key and managerial posts at all levels. In ethnic minority areas, ethnic minority people must hold key posts. 2. To ensure appropriate ratios of ethnic minority cadres, prioritizing those who are female and young to work in agencies and organizations within the political system at all levels. 3. Ministries, branches and localities shall plan, train, retrain, appoint and employ ethnic minority personnel. 4. The Ministry of Home Affairs shall assume the prime responsibility for, and coordinate with concerned ministries and branches in. detailing and guiding this Article. Prestigious persons in ethnic minority areas may receive training, retraining, preferential treatment and other incentives suitable to local socio-economic conditions to promote their role in the implementation of the ethnic minority policy in their residential areas. 1. To support the collection, study. protection, conservation and promotion of fine traditional cultural values of ethnic minority groups in the ethnic community of Vietnam. 2. To support the conservation and development of the scripts of ethnic minority groups. Ethnic minority groups shall conserve their fine traditional cultures, languages and scripts under law. 3. To elaborate and implement a national target program on conservation and promotion of traditional cultural values; to support the investment in and protection and conservation of state-ranked historical and cultural relics. 4. To give incentives for ethnic minority groups to enjoy cultural benefits; to support the formation and effective operation and use of grassroots cultural institutions in ethnic minority areas. 5. To conserve and promote fine traditional festivals of ethnic minority groups, to regularly organize region-based or ethnic minority-based culture-sports events in ethnic minority areas. 1. To conserve and develop traditional physical training and sports of ethnic minority groups. 2. To support physical training and sports activities and invest in building stadiums, sports halls and physical training and sports centers in ethnic minority areas. To support infrastructure construction for tourism associated with environmental and ecological protection; to support the promotion and diversification of tourism forms and products, to reasonably tap potential in landscapes and scenic places for tourism development. 1. To assure ethnic minority groups' use of healthcare services; to implement the healthcare and health insurance program for ethnic minority groups under law. 2. To build, consolidate and expand healthcare establishments; ensure sufficient preventive and curative medicines for ethnic minority groups in areas with socio-economic difficulties and exceptional socio-economic difficulties. 3. To support the conservation, exploitation and use of valuable folk remedies and traditional curative methods of ethnic minority groups which have been recognized by competent slate agencies. 4. To ensure population quality improvement and reasonable population development of each ethnic minority group under law. 5. To boost the socialization of healthcare, to adopt priority policies for organizations and individuals investing in and developing healthcare in ethnic minority areas. 6. The Ministry of Health shall assume the prime responsibility for, and coordinate with concerned ministries and branches in, detailing and guiding this Article. 1. To invest in information and communication development in ethnic minority areas, to provide essential means to assure the right to access and receive information. 2. To build and consolidate the system of information on the ethnic minorities situation and implementation of the ethnic minorities policy. To develop a national system of statistical indicators on ethnic minorities; to communicate and regularly or irregularly report on socio­economic situation, security, defense, natural disasters and floods in ethnic minority areas. 3. To develop and apply information technology to the system of ethnic minorities affairs agencies. 4. To increase and improve the quality of use of ethnic languages in the mass media. 5. The Ministry of Information and Communications shall assume the prime responsibility for, and coordinate with concerned ministries and branches in, detailing and guiding this Article. 1. Ethnic minority groups in areas with exceptional socio-economic difficulties may receive free legal aid services under law. 2. Administrations at all levels shall elaborate and implement programs and schemes on law dissemination and education and legal aid suitable to each target group and ethnic minority area. 3. To effectively use the mass media, to diversify forms of law dissemination and education suitable to the customs and habits of ethnic minority groups. 4. The Ministry of Justice shall assume the prime responsibility for, and coordinate with concerned ministries and branches in, detailing and guiding this Article. 1. To use, exploit and develop natural resources and the environment and ecology of ethnic minority areas under law. 3. To propagate, educate and mobilize inhabitants in areas with natural resources to raise their awareness about protection of the environment, ecology and biodiversity. 4. The Ministry of Natural Resources and Environment shall assume the prime responsibility for. and coordinate with concerned ministries and branches in. detailing and guiding this Article. 1. To build and consolidate defense and security in important, deep-lying, remote, border and island areas in association with socio­economic development, assuring political security and maintaining social order and safety in ethnic minority areas. 2. State agencies, ethnic minority groups in border and island areas shall, together with agencies, organizations, people's armed units and local administrations, protect the national borderline, maintain security and social order and safety and enhance friendship relations with people of neighboring countries in border and island areas under law. 1. To promulgate, and direct the implementation of. strategies, national target programs, master plans, plans and policies on ethnic minorities work. 2. To promulgate legal documents on ethnic minorities work; to elaborate and implement ethnic minorities policies, particular policies, programs, projects and schemes on development of ethnic minority areas with socio-economic difficulties and exceptional socio-economic difficulties; criteria for identification of ethnic minority areas based on development level, criteria for identification of ethnic minority groups, and poverty line applicable to ethnic minority areas; to elaborate policies to train human resources, raise people's intellectual level and conserve and develop the cultures of ethnic minority groups. 3. To strengthen the organizational apparatus of ethnic minorities affairs agencies from central to grassroots level; to effectively assign and decentralize ethnic minorities work. 4. To raise and efficiently use resources invested in ethnic minority areas. 5. To examine, inspect, review and evaluate the implementation of policies, programs and projects in ethnic minority areas; observance of the law on ethnic minorities work, corruption prevention and fighting, thrift practice, waste fighting, and settlement of complaints and denunciations related to ethnic minorities work under law. 6. To disseminate and educate the Party's line and policies and the State's law with different measures and forms for ethnic minority people to understand and actively participate in their implementation. To propagate the traditional unity of ethnic minority groups in national construction and protection. To well organize campaigns for mutual support and assistance among ethnic minority groups in communities. To organize friendship activities between localities for mutual assistance in socio-economic development, hunger elimination, poverty reduction and settlement of daily-life problems. 7. To plan, train, retrain, employ and manage ethnic minority cadres in the political system and cadres in ethnic minorities affairs agencies. 8. To build a database on ethnic minorities work. 9. To appraise programs, projects, schemes and plans on socio-economic development in ethnic minority areas. 10. To conduct theoretical research and practical review of ethnic minorities work, ethnic minorities strategy and policy and slate management of ethnic minorities work. 11. To carry out international cooperation in ethnic minorities work, to coordinate with foreign organizations and individuals and international organizations in studying and exchanging experience in ethnic minorities work: to encourage assistance and support for development investment in ethnic minority areas and areas with socio-economic difficulties and exceptional socio-economic difficulties and assist these areas in effectively implementing ethnic minorities work and the ethnic minorities policy under law. 1. The Government shall uniformly perform the state management of ethnic minorities work. 2. The Committee for Ethnic Minorities Affairs shall assist the Government in performing the state management of ethnic minorities work nationwide. 3. Ministries, ministerial-level agencies and government-attached agencies shall perform the state management of ethnic minorities work under law. 4. People's Committees of all levels shall perform the slate management of ethnic minorities work in their localities under law. 5. Ethnic minorities affairs agencies shall be organized at central, provincial and district levels in ethnic minority areas. 1. To assume the prime responsibility for. and coordinate with the Committee for Ethnic Minorities Affairs in, performing the state management of ethnic minorities work and settling matters related to ethnic minorities work within the ambit of their assigned functions, tasks and powers. 2. To elaborate, promulgate or propose competent authorities to promulgate policies, programs and projects under their management for application to ethnic minority areas, areas with socio-economic difficulties and exceptional socio-economic difficulties, ethnic minority groups with a very small population, ethnic minority groups with exceptional difficulties, and poor ethnic minority households; to guide, examine, inspect and review the implementation of policies, programs and projects under their management. 3. To biannually and annually submit reports on ethnic minorities work and the implementation of the ethnic minority policy under their state management to the Committee for Ethnic Minorities Affairs for summarization and reporting to the Prime Minister. 4. To perform other state management tasks in ethnic minorities work as assigned by the Government. 1. To assume the prime responsibility for. and coordinate with concerned ministries and branches in, planning, elaborating and implementing the ethnic minorities policy; to guide, inspect, examine, review, assess, disseminate and mobilize the implementation of the ethnic minorities policy under this Decree. 2. To assume the prime responsibility for, and coordinate with ministries, branches and provincial-level People’s Committees in, performing the state management of ethnic minorities work and settling related matters. To annually report to the Prime Minister on the implementation of the ethnic minority policy and ethnic minorities work. 3. To perform other tasks assigned by the Government. 1. To implement the Party's policy and the State's law on ethnic minorities work under law and this Decree in their localities. 2. To annually elaborate and implement plans and programs on ethnic minorities work. To organize, direct and inspect the implementation of law and policy on ethnic minorities; to organize and direct the application of measures to ensure improvement of material and spiritual life for ethnic minority people. 3. To elaborate and implement local policies, programs and projects for ethnic minority areas and areas with socio-economic difficulties and exceptional socio-economic difficulties. 4. Provincial-level People's Committees shall biannually and annually submit reports on ethnic minorities and the implementation of the ethnic minorities policy and ethnic minorities work in their localities to the Committee for Ethnic Minorities Affairs for summarization and reporting to the Prime Minister. 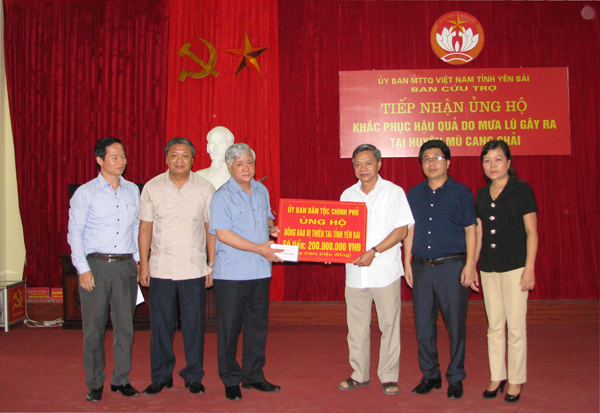 The Vietnam Fatherland Front Central Committee and its member organizations shall coordinate with the Committee for Ethnic Minorities Affairs and concerned ministries and branches in supervising, disseminating and mobilizing the implementation of ethnic minorities work and the ethnic minority policy under this Decree. 1. This Decree takes effect on March 4, 2011. 2. Previous regulations related to ethnic minorities work which are contrary to this Decree are all annulled. 1. The Committee for Ethnic Minorities Affairs shall assume the prime responsibility for. and coordinate with concerned responsible ministries, branches and localities in, detailing and guiding Articles 5 and 12, and Clause 5, Article 22 of this Decree. The Ministry of Culture, Sports and Tourism shall assume the prime responsibility for, and coordinate with concerned responsible ministries, branches and localities in, detailing and guiding Articles 13, 14 and 15 and other necessary provisions of this Decree.